This method is super fast and uses only washes to get the colors down. You can do this whole project with these basic colors pictured below, plus a dark silver metallic (we both used old GW Boltgun Metal). Of course there are other details, like pipes, wires, eyes and tongues that need to be dealt with too. But for simplicity's sake, we're just talking the basics here. The steps go something like this. - Once the Nuin Oil is dry, apply a wash of Drakenhof Nightshade to the main shell-like body sections. - Then wash the fleshy areas (Head, Hands, Feet) with Druchii Violet. 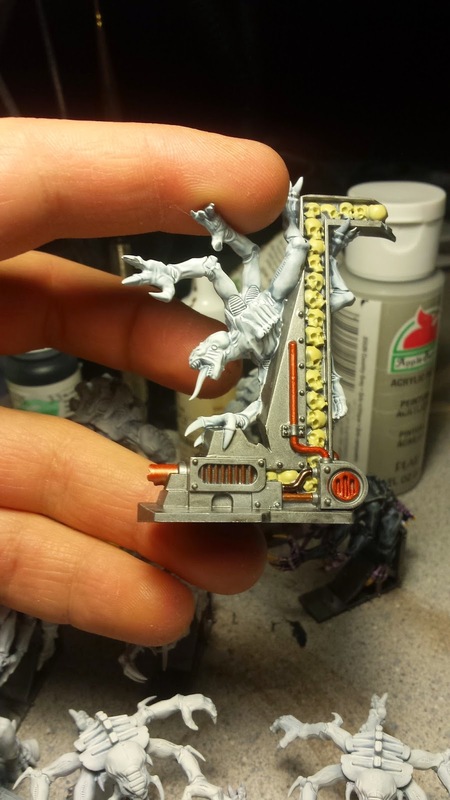 - Once the washes are dry, take a very large flat brush and lightly drybrush the whole Genestealer with Ushabti Bone. - Finally, paint all their teeth and claws with Ushabti Bone and wash it with a Sepia or Brown wash. I used some old GW Griphonne Sepia. - Then once all of it is dry, you seal it up with a nice coat of Matte Varnish. According to Dan's tutorial and conversations about it with him on Twitter, I believe he only used a single coat of wash for each section. I could be wrong. But I decided that I wanted them to be a bit darker and felt that the single washes were a bit too transparent and a bit on the pastel side. That being said, I went with a single Nuin Oil coat, followed by 2 coats of Drakenhof Nightshade and 2 coats of Druchii Violet. This made the colors the darkness I was looking for. Working with the washes was a bit more sloppy that I usually am though, and I ended up with Blue and Purple on the base. So I did a bit of touch up with Boltgun Metal and washed it with Nuin Oil again. I've since decided not to worry about highlighting the base and stick with the dark metal look, since I'm going more for tabletop quality rather than display quality. The whole process is quite fast and the slowest part of it was waiting for the washes to dry. 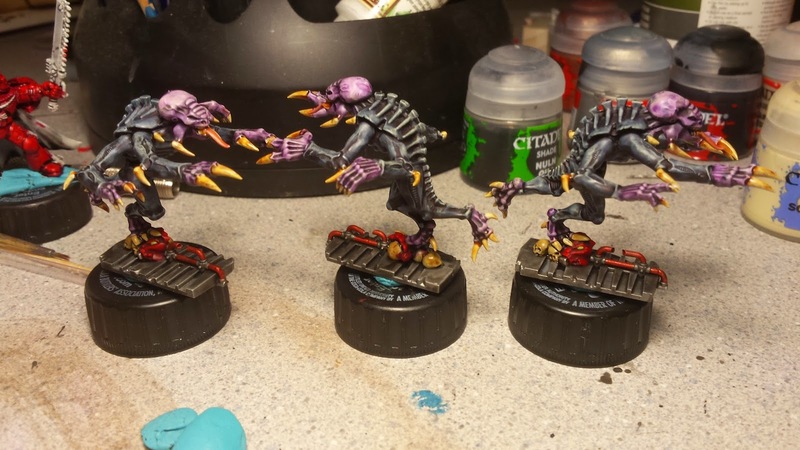 As of last night I started painting the bases for the rest of the brood, complete with details. They will be wash completely with Nuin Oil and any skulls will be followed up with either a Sepia or Brown wash, I haven't decided yet. Either way. I'm super happy with the results and am glad to have discovered this technique. I can take no credit for this at all. 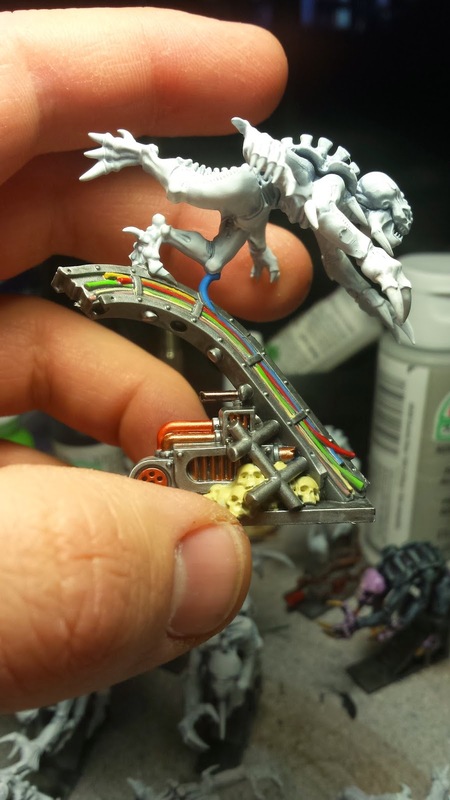 You can read the original post about it over here and see how Dan converted his Blood Angels into Deathwing Terminators instead. Now I just need to come up with a set of colors and a way to quickly paint my Terminators. 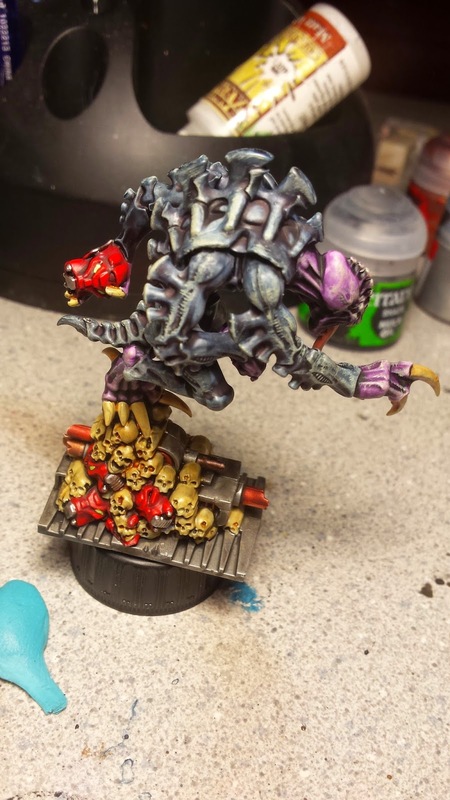 Since originally writing this post, I've since continued on painting the Genestealers. Things are moving along nicely and I've been able to chain the minis together in an assembly line of sorts. Following the steps above, I covered the entire brood with a coat of Nuin Oil and 2 coats of Drakenhof Nightshade. I did need to wait overnight to apply the 2nd coat of blue though, because the first coat wasn't drying didn't want to cooperate. Once the first coat of blue was dry, I was able to wash the second coat of blue and continue on. I made a slight deviation to the formula at this point though and decided to paint the tops of their bulbous heads in pure white to brighten that area up. I had already done this step on the test mini, but didn't mention it before. I think it works out well and gives their head a little bit more color variation. 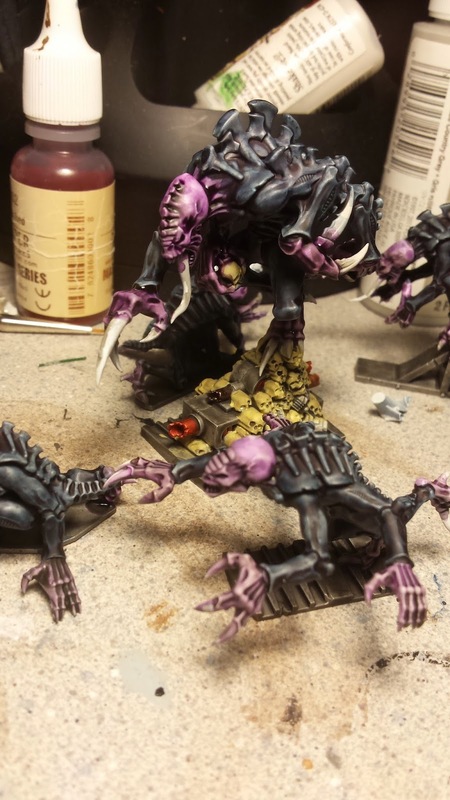 Applying the Druchii Violet was a lot faster than the blue was, mainly because of the difference in surface area. I was tempted to leave it be after one coat, but knew that the color would already lighten up a bit after the drybrushing, so I went with 2 coats again. After a few hours of work, the entire force was finished and looks really good! But I still need to drybrush them and do touch up work on their bases. Either way, I believe that they will be completed tonight! 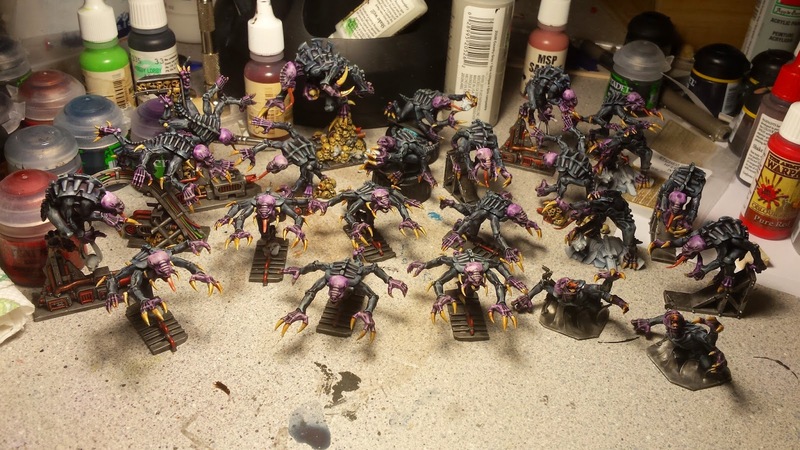 The Genestealers are now (mostly) finished! After another overnight dry time, it was time to paint the remaining details. This was actually one of the more tedious parts of the whole project, because of all the tight spaces and the amount of claws I had to paint (I actually missed a couple and had to backtrack). 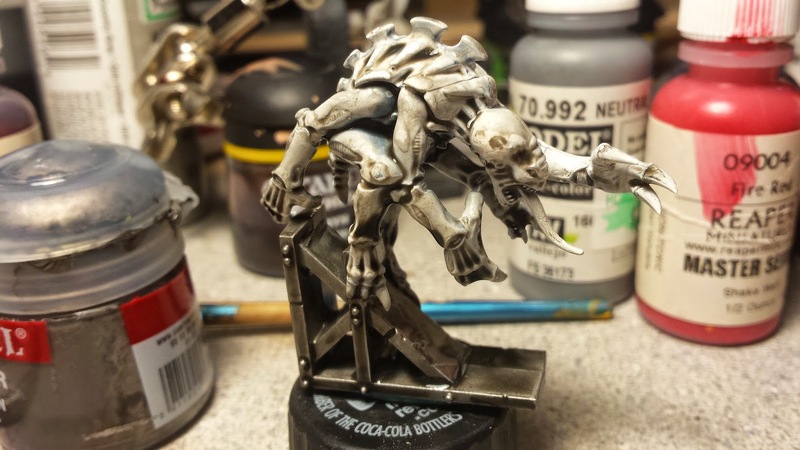 The teeth and claws were all painted with Ushabti Bone and then washed with GW Griphonne Sepia. I didn't follow it up with any sort of highlight and they were left as is. 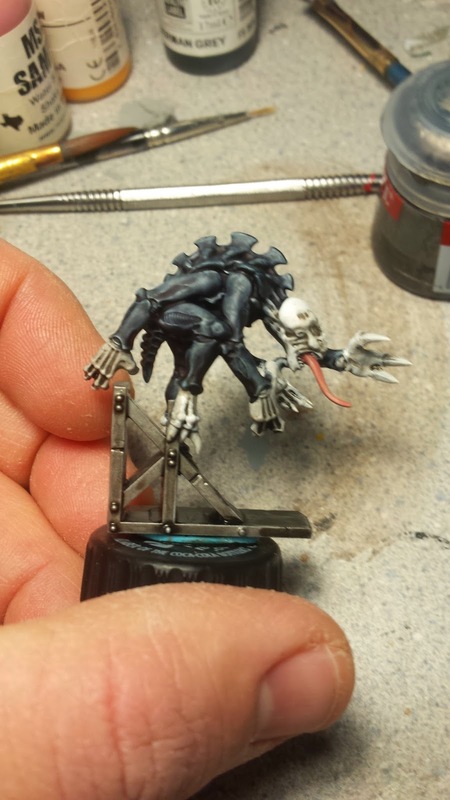 Then I used some a sample of Reaper paint for their tongue color. Unfortunately I don't know the name of it, since it was marked "Sample" and didn't have a color name on the label. The tongues were then also washed with Griphonne Sepia and no other highlights. Once that was done, the long process of looking over the bases for touch up areas started. After about an hour of inspecting and painting, the sloppy sections were all covered and it looks pretty good. The only thing left now is to do any remaining Blood Angel corpses/ parts. 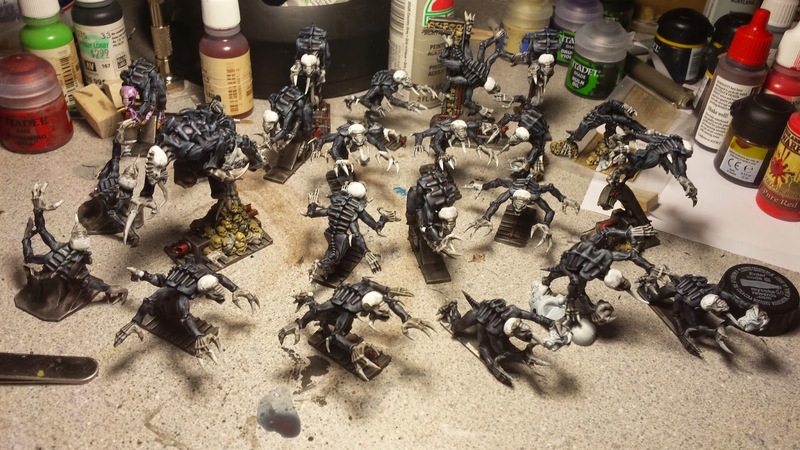 But I can't do that until I start painting the Terminators, since I need to keep all of their colors similar. Though, I am planning to add some wear and tear to them. 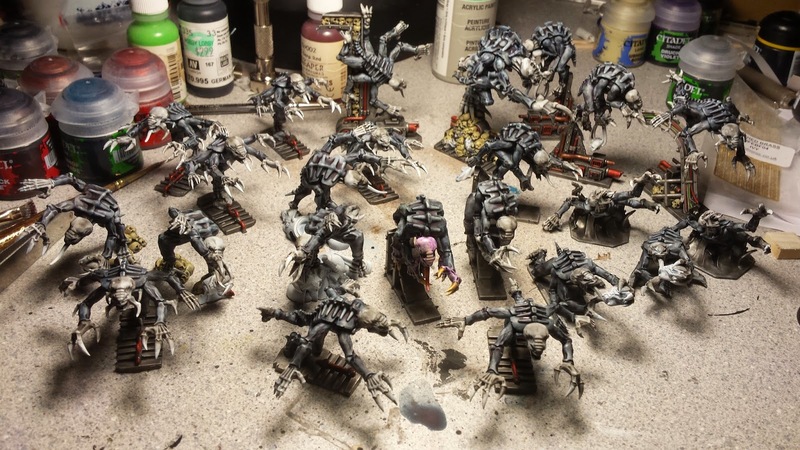 For now, I haven't taken any "studio" shots of the Genestealers. 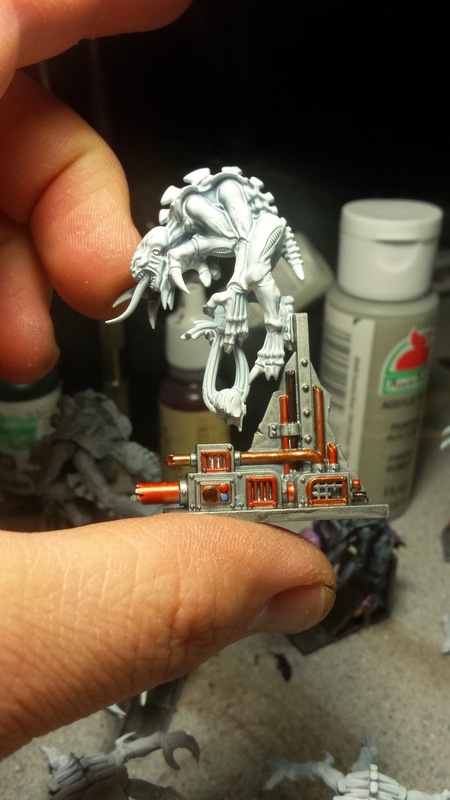 That'll have to wait for once Space Hulk is completely painted. But damn these guys look great! 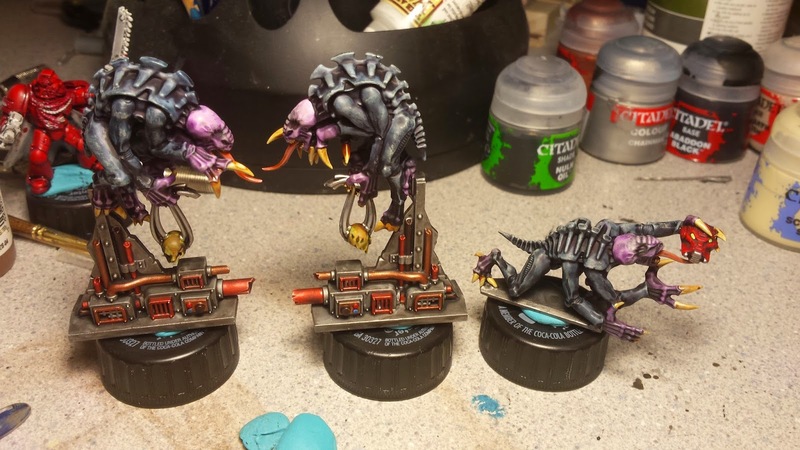 The Genestealers have sat in the box for awhile now, since I've finished them. 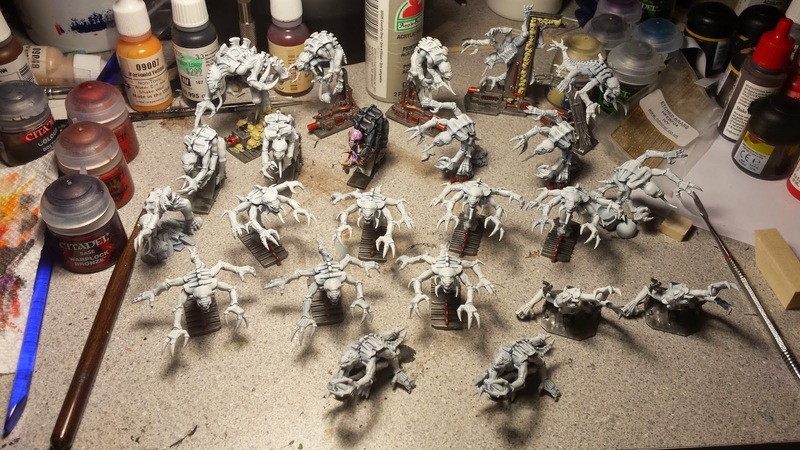 So, now that I've finished the 1st painting for the Great Cyclopean Gemstone Heist, I decided that it was time to finish these guys and get them clear-coated, so I can actually play a game. Also, other than projects, I was waiting to decide on a solid way of painting the Blood Angel Terminators in a easy and efficient way. I ended up scrounging through the bits box and found some left over pieces from a Space Marine Captain and Biker Squad. 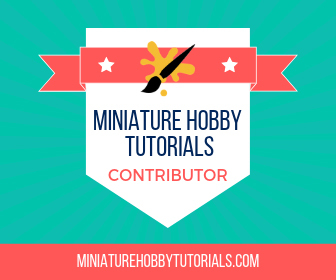 I melded them together to form a new mini and set about using him as a test mini. 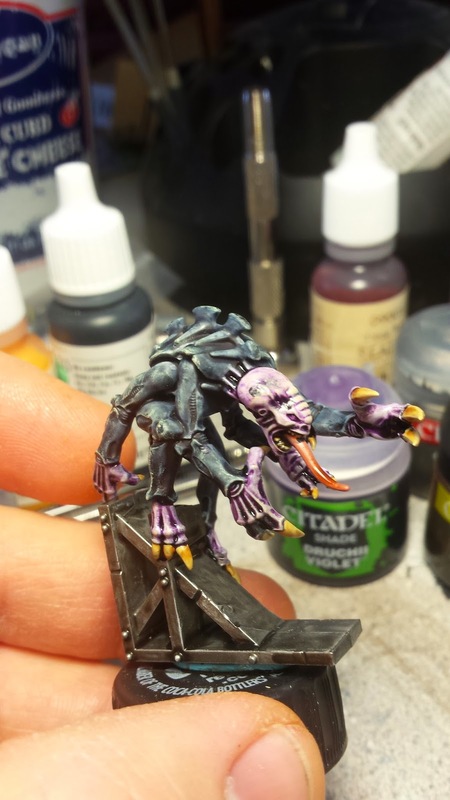 Originally I tried doing just washes, similar to the Genestealers. But it didn't work well at all. 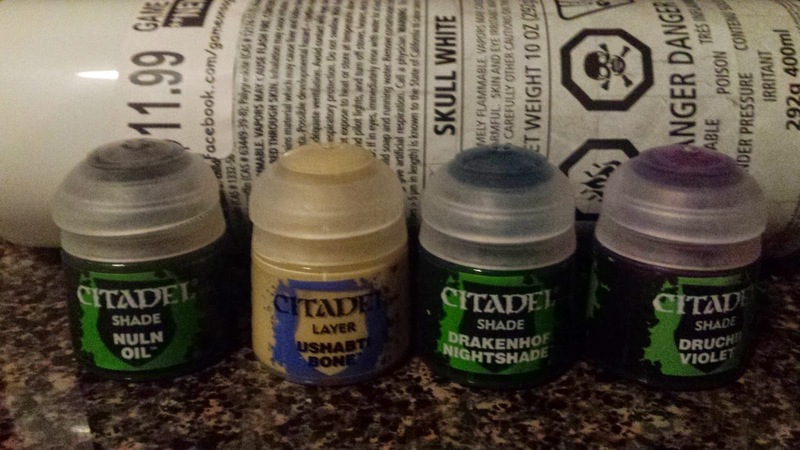 So, I ran to the store and picked up some actual GW paints. 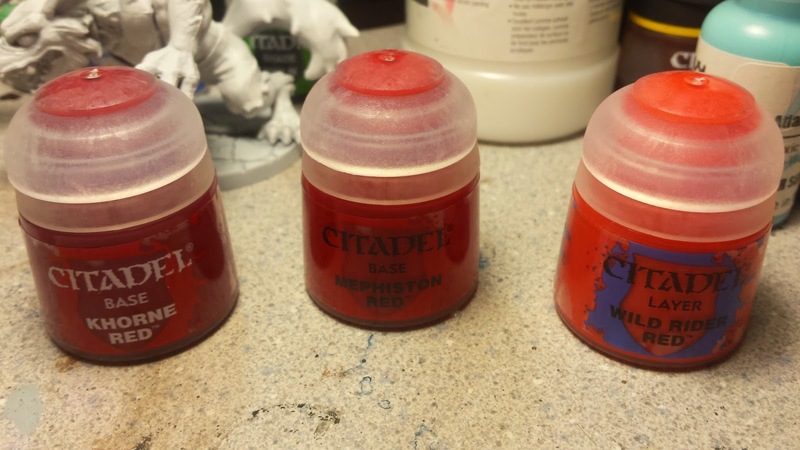 After about 10 mintues of staring at the paint rack, and comparing all of the shades of red that GW has available I went with Khorne Red, Mephiston Red and Wild Rider Red. 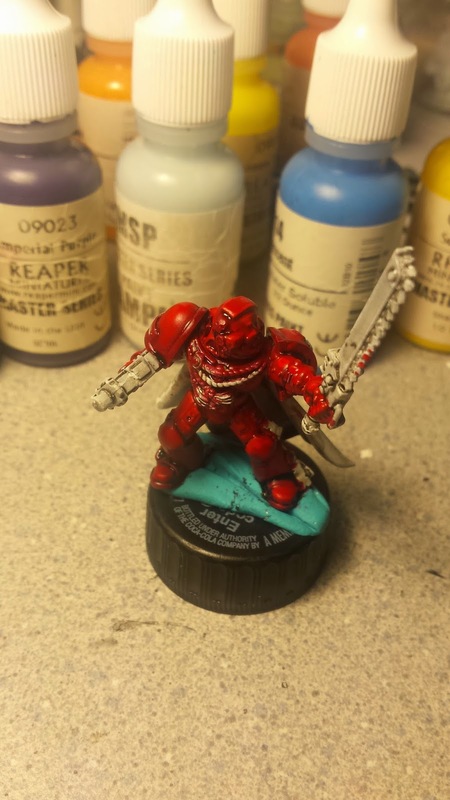 I decided that I wanted my Blood Angels to be slightly darker than the suggested coloring and went with Khorne Red for the base. I actually would have liked to been a littler darker. But didn't want to mix and I didn't want to use a red/brown for the base color. But Khorne works well.The test mini ended up being a great move on my part. Wild Rider Red is a lot brighter than I was expecting, and ended up being too orange. Luckily, thanks to Twitter, it was suggested that I glaze over it to knock down the orange a bit. I was on a roll too! I was able to get all of the red sections painted, as well as the metallics and the eyes for the Terminators helmets all done. I did cheat a little on my metallics. Just like the bases, I didn't recoat them after the wash, as I'm going for more table quality than display quality on this project. I was riding the hype train pretty high. That was, until I went to gather them together and get pictures. It was then that I realized I had left one Genestealer in the box! Overall, it wasn't a huge deal. The only thing that needs to be done is the helmet he's holding. 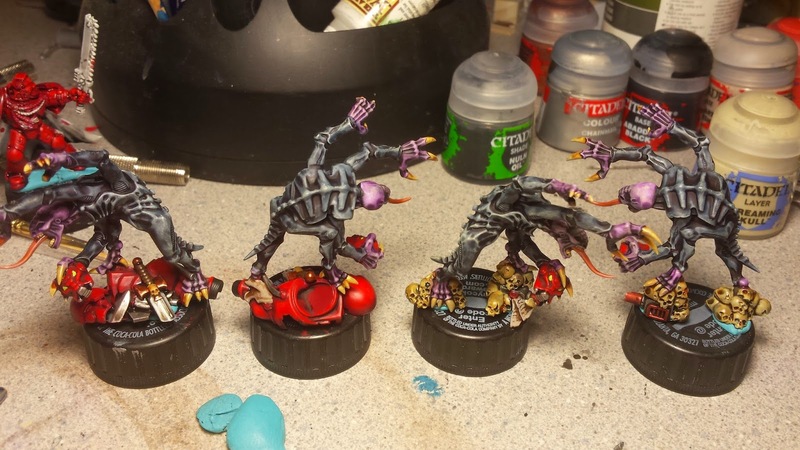 But once that's done, then the Genestealers will be complete! Once again, I haven't taken any "studio" pictures of them. That will be done when the game is fully finished. Of course when that will be depends on how progress goes with the Museum's Painting #2. And I also have a lot of Super Dungeon Explore to paint up too (even more once Forgotten King arrives). 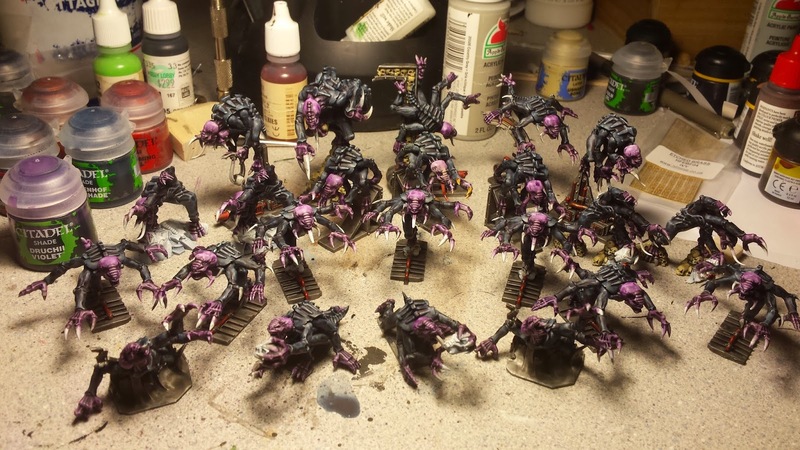 But for now, the Genestealers are finished and half of Space Hulk is complete!